Today I spent $350 at the dealer in services. I also spent all day there, from 10:30 am to 6:00 pm. One of the many things I had to get fixed was a nail in my tire. They told me that when they took out the tire, they discovered that it had been broken from when it was first installed by whoever installed it. Tire kingdom was who installed it. they took the time to explain to me how it was broken. and then sent me off on a spare tire across town to go claim my tire to tire kingdom. when i got to tire kingdom and i told them what toyota had told me they laughed at me and said there was no way i could have driven for a year and a half had they installed the tire with such rupture on it. and they told me that whoever took it off had broken it. of course i figured that if i went to the dealership who had already lied to me and told them what tire kingdom said it would just be their word against tire kingdom. so i spent the rest of my afternoon going to firestone, tires plus, and sears. everyone laughed at the story the toyota people had told me and said there was absolutely no way that I could have driven on that for a year and a half, totally impossible. 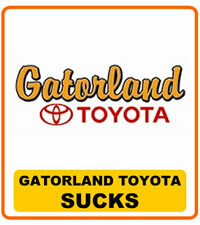 this has been the worse experience ever, my family and i have been toyota fans for a very long time until now. i cannot believe such a big corporation would take advantage of a college student. not only that they took me for stupid.